Lattes and Llamas Geek-a-Long - Sprite Stitch Board! I recently stumbled across the Lattes and Llamas Geek-a-Long. Since I haven't seen it mentioned here I thought I'd mention it in case anyone is interested. Each year the ladies at Lattes and Llamas plan a year long craft-a-long based on a geeky theme. This year's theme is video games. They release a new square for knitting or crocheting each week (some people cross stitch or quilt them instead). The goal is to create at least 24 squares in the year and stitch them together into a crazy awesome afghan. The patterns are free, they simply ask that you consider making a contribution to Child's Play if you are able. Here are the squares I've made so far to give you an idea. They are double knit, so they are completely reversible! You can get the patterns (including for previous years' afghans) on the Llama's blog. Or there is a Ravelry group as well. Wow, your squares look great! 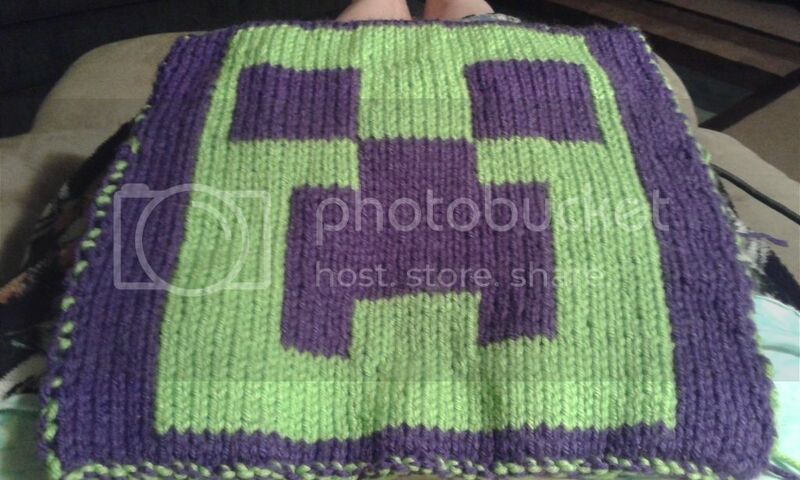 I stumbled across this back in 2014, and made 12 of the squares to make into a small blanket. The 12 squares were finished early 2015.... I bought the edging wool last month. I really need to get this finished! I wasn't going to add any more squares, but I do love the ones they've released so far this year... and I may have to get some of them knitted up! Looking forward to seeing the other squares that you pick. Wow...what a fun project! All of the squares look great! Thanks for sharing. I haven't heard of them and will check it out. I love this! Your squares have turned out awesome so far. Now off to buy the yarn, this would be an awesome baby blanket idea for my little guy! Thanks everyone. I appreciate the encouragement. Since I'm brand new to double knitting, these squares are taking forever. Hopefully I'll start getting a little faster at them at some point! It's nice to see some other SpriteStitchers taking an interest in this and I'm hoping to see some more square pics! Blackberrybear, I love yours. The yarn makes them look very unique. lcockitt, 12 squares for a lap blanket is seeming like a really good idea. I'm pushing for the 24, but with how long they are each taking at this point it may be a bit of a reach. I hope you get your edging done and share some photos! Here's my latest square. Now I'm mostly waiting for the new colours of yarn I ordered to arrive, or for new squares to get released that I want to make that use the colours I already have. I had to grab a bunch of patterns! 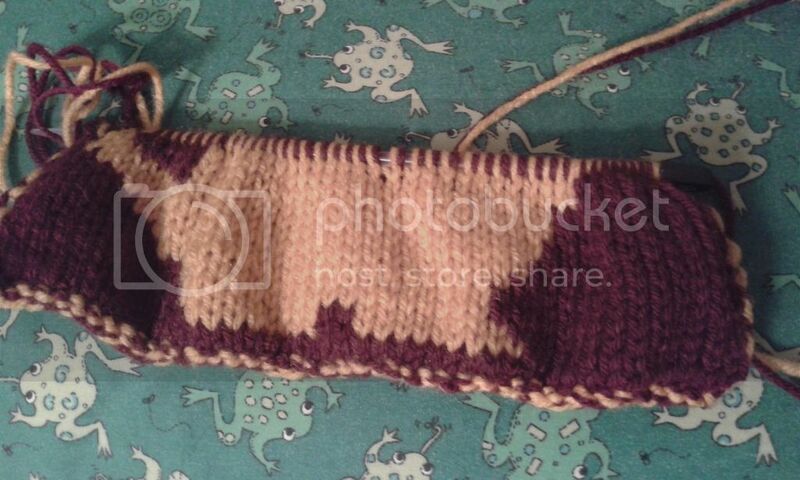 I haven't done any double knitting in YEARS, so it took me a bit to get back into the groove I don't have any pics, but I am about 15 rows into the Gryffindor Lion and I am thinking of doing the brand new Minecraft square as a gift. I finally had the courage to attempt joining and edging the 12 2014 squares... And am pretty happy with how it turned out! (yes, I know that the LotR and Firefly squares are the wrong way round to each other - done on purpose so that there isn't a true "right" side or "wrong"side). Now all I have to do is try not to cast on any of this years squares... which look really cool and I really want to do! Must finish up a couple of other projects first. Really looking forward to seeing everyone else's squares and finished blankets! Can't wait to see what others are working on!